SANTA ROSA, Calif., October 9, 2012 — Thermal Technology recently shipped a 25-ton, 10,000 amp spark plasma sintering (SPS) system to Idaho National Laboratory’s (INL) Center for Space Nuclear Research (CSNR). 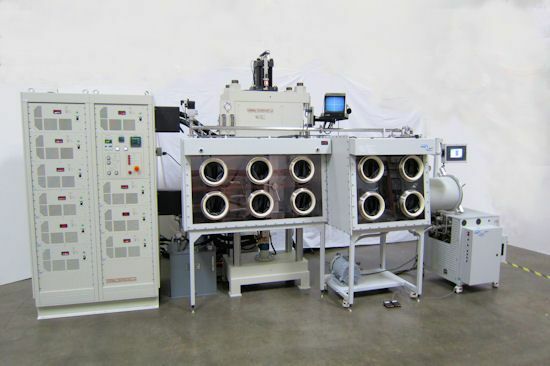 The SPS Model 25-10 is fitted with a glove box for handling materials in a controlled environment and will be integral to the CSNR’s study of advanced high-temperature fuel and structural materials fabrication. Dr. Robert O’Brien of the INL’s Center for Space Nuclear Research is the Principal Investigator for their cermet fuels and radioisotope encapsulation research programs, and serves as the Radiological Spark Plasma Sintering (RSPS) Facility lead. “Located at INL’s Center for Advanced Energy Studies, the RSPS facility will allow the CSNR to conduct pioneering research into advanced fabrication methods for future high performance nuclear fuels, while creating a truly unique facility that will be open for collaborative use by the international research community,” says O’Brien. SPS has multiple commercial applications. SPS technology is in a class of non-conventional sintering techniques, because heat is generated internally as opposed to conventional methods of materials densification such as hot pressing, wherein the heat is external to the sample. While traditional methods of materials processing require hours to reach peak temperature, SPS takes only minutes. The clear benefits are the significant saving of time and energy and the ability to retain material grain structures; the latter being an important feature when processing nano-structure materials. Thermal Technology is a global manufacturer of advanced thermal processing systems including crystal growth technology, hot presses and SPS systems, and high temperature vacuum and controlled atmosphere laboratory and production furnaces for the advanced processing of metals, ceramics, glass, quartz and crystal growing applications. Thermal Technology has over 60 years of experience and more than 3000 installations in 40 countries.